Head on Collisions: West Virginia Car Accidents and pictures from Car-Accidents.com: He ended up with a broken pelvic bone, broken femer, broken ankle, and 5 broke rib bones, which punctured his lung. 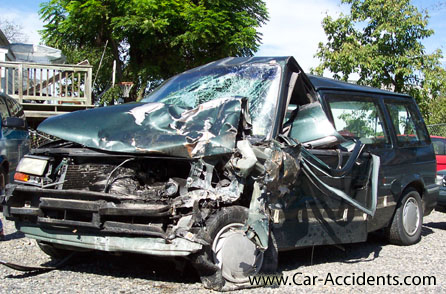 On September 5, 2003, at about 10:15, 5 people were injured in a head-on collision. My name is Alisha, im 15. Their were 3 people including myself, in the van pictured above. We were on our way home from the Outback. On Rt.45 West, Martinsburg , West Virginia. When we came around a sharp turn, and going on the straight-a-way. A jeep, with no headlights, and 2 drunk people, came left to center, and hit us head on. The jeep ramped up onto us, and flipped, while it was on the roof of our car, and went into a 5 foot ditch. The guy that was driving our van, was sent air care to Fairfax, Virginia 2 1/2 hours away. He ended up with a broken pelvic bone, broken femer, broken ankle, and 5 broke rib bones, which punctured his lung. The other passenger walked away with a broken ankle, and scrapes on his head. I myself had to be transfered by ambulance to another hospital, in virginia. I had a burn make on my leg, stretching 5 inches in length, and 3 in width. I also had bleeding in my brain, and swelling. In the jeep, the driver got ejected onto the road, he broke all the bones in his face, and got most of his teeth knocked out. Im not sure which one but one of them also had a broken femur bone. They were not wearing seatbelts. Luckily everyone lived, but the paramedics, said we shouldnt have.